Automation and gold have much in common. One of the most coveted materials in the world, gold isn’t just beautiful – it has a wide array of uses within industry. ’Au’ is of course the first two letters of automation! Automation is the gold of the software world. It’s the backbone of modern business, enabling communication and orchestration between components. As the only company with a dedicated automation team, at CA Technologies, we set the Automation Gold Standard. 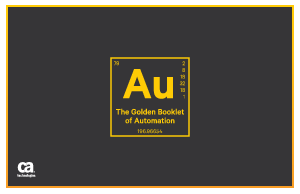 With that in mind, this is our Golden Book of Automation.